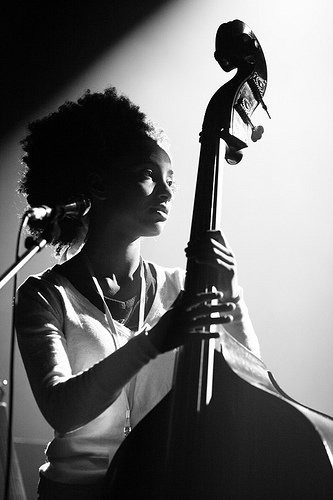 Just got word that gifted jazz bassist and singer Esperanza Spalding is coming to Birmingham on Thursday, February 19th, 2009. She’ll be in the city for a workshop and evening performance at The Historic Carver Theater & Alabama Jazz Hall of Fame. Workshop begins at 9:00 am and show begins at 7 pm. Its so great seeing this sister crossing musical barriers..
Tickets are available at (205) 975-ARTS and at The Alys Stephens Center. More about the workshop here. For music and videos check out her website, plus performances and epk on youtube.